I’ve been busy and away recently so not many updates. But I’ve also read quite a few recently published research papers on banking and thought I should mention two in particular, both by BIS researchers. 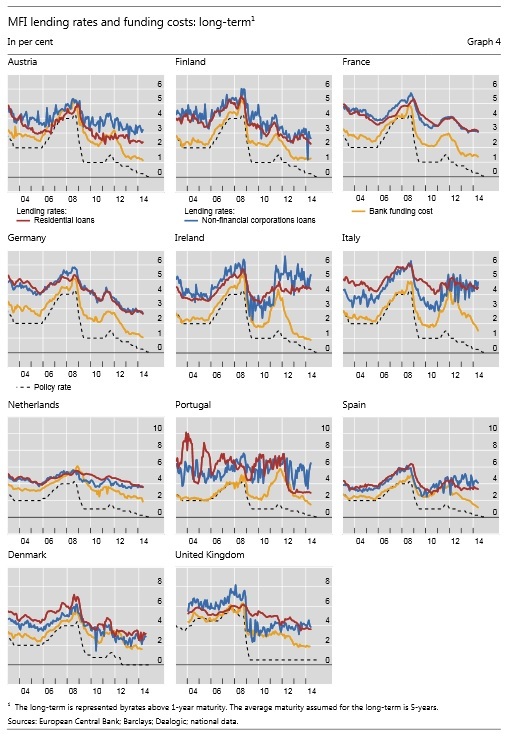 The first, by Illes, Lombardi and Mizen, titled Why did bank lending rates diverge from policy rates after the financial crisis, is directly reminiscent of my posts on banks’ margin compression due to the low interest rate environment. This paper is quite interesting, in particular for the data it gathered. But, it misses the main point. 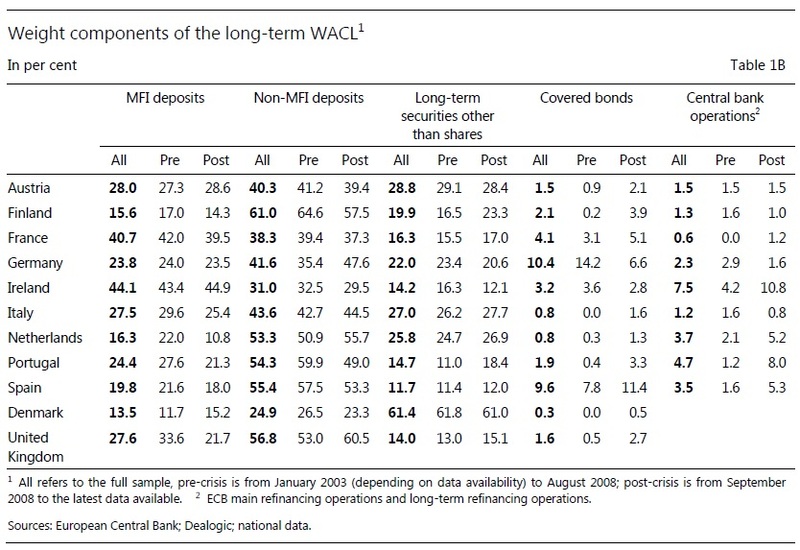 there is stronger evidence for a stable relationship between lending rate and the WACL measures we use to reflect funding costs of banks. We conclude that banks do not appear to have fundamentally changed their pricing behaviour in the post-crisis period even though bank lending surveys indicate that their credit standards have tightened since the financial crisis. Banks’ demand deposits indeed reach the zero lower bound first, strongly reducing banks’ ability to further reduce their average costs of funds*. If lending rates had a strict relationship with funding costs, they would then stop falling at this point. Problem: a number of legacy variable rate loans (originated before rates started to fall) are calculated as central bank base rate + spread or LIBOR + spread, which continue to fall. This compresses banks’ margins, in turn endangering their profitability (you need to make revenues to pay for your non-interest operating costs…). Banks have no choice but to progressively increase the spread in variable rate loans (on new lending, and, if possible, on legacy lending). Risk premia (to cover for the cost of risk) and other factors as described by this paper are to be added on top of this compression phenomenon**. Tomorrow I’ll review the second piece of research, on macro-prudential policy effectiveness. **To be clear, when funding cost does not fall as much as central bank’s base rates, it’s often the case that compression has been achieved (i.e. liabilities have reached the zero-lower bound, or close). When funding costs do fall (almost) as much as base rates, but the spread between lending rates and funding costs is widening, it often means that the risk premium is increasing (such as in Spain, Ireland or Italy). This comment: “the adjusted policy rate is not the marginal cost of funds for banks” indicates that they are looking for perfect competition in banking. Their analysis can be boiled down to the fact that banking is not perfectly competitive. Imagine that!